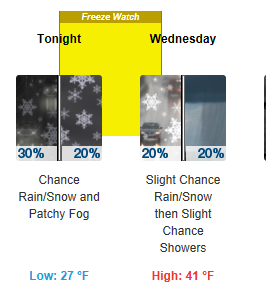 A chance of rain and snow showers before 1pm, then a chance of rain showers. Patchy fog before noon, then patchy fog after 5pm. High near 39. A chance of rain and snow showers before midnight, then a slight chance of snow showers after 5am. Patchy fog with a low around 27. This entry was posted in Uncategorized on October 9, 2018 by ssmith3.